Home> Resource> iOS Transfer> How to Print Contacts from iPhone? Q: My father is old and he likes to use the telephone to make calls. But the telephone book is lost and now he needs a new telephone book. Because he cannot remember the telephone numbers. I think it is troublesome to copy the telephone numbers manually from my iPhone so I want to print the contacts from iPhone directly, which will save much time and efforts. So that's why I am here to ask for help. I want to know how to print contacts from my iPhone easily and quickly. It will be appreciated if you can offer me some advices. People may meet many situations that require you to make a backup of the contacts from your iPhone to computer. For example, you may lose the contacts due to the wrong operation or accidents. Sometimes all the files may be lost if you failed to update your device. Then you may need to recover the deleted data from your iPhone. Here we will tell you how to print the contacts as a backup. - The software can support various types of iOS devices like iPhone, iPad and iPod with high compatibility. 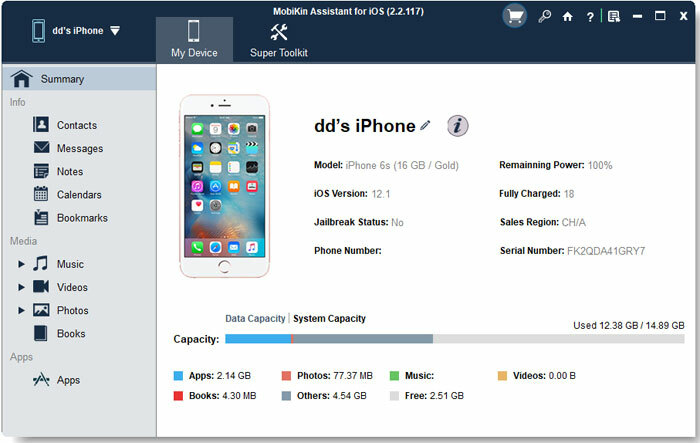 - The users are able to manage many files in the iPhone like contacts, voice memos,messages, photos, books, videos, music, note, safari and so on easily and quickly. What's more, you can export these files to the computer as a backup with no hassle. - The software is easy to operate and you can finish the managing operation quickly. The software will detect the connected device automatically and deeply and then all the files will be displayed on the interface as different categories. So you can find the target files quickly. - The software is 100% risk-free and clean without any spyware, malware and viruses. You can download the free trial version by clicking the icons below. By the way the free trial version's functions are limited and you can get the pro version on the official website. Step 1. 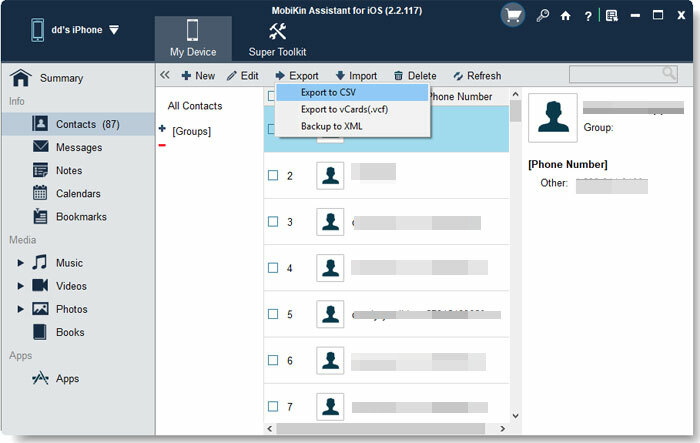 Download and launch the iPhone Contacts Manager software on your computer, then connect your iPhone to computer with USB cable. Here, you need to turn to your iDevice and click "Trust" button on it to authorize the computer. Then you will see an interface like this with many categories on the left panel and the main parameters on the right panel. Step 2. Click on the Contacts option to preview the contacts that are saved on the iPhone. You will also see the name, phone number, email and address on the right panel. Mark the wanted contacts and then hit the Export button to transfer them to computer. You can download the free trial version of the software by clicking the icons below. Just have a try!